Receive your Online Elemental Analysis Feng Shui Report anywhere WORLDWIDE Today! 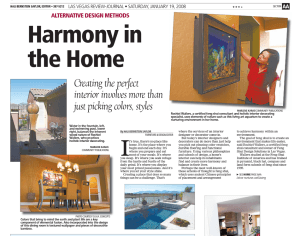 This unique holistic elemental analysis was featured in the Review Journal’s article “Harmony in the Home”. Your elemental nature report is easy to receive and essential if you want to find out specific ways that will allow you to feel less stressed and more productive in your home or work environment. This elemental test was developed at the Feng Shui Institute of America, which is a holistic science based Feng Shui school that specializes in teaching Pyramid Feng Shui. This elemental test is a unique holistic approach, it is not a Bazi or a Kua report. This elemental analysis will be unique to you. It determines which elements are dominant in your current life experience and personality. It is not related to your birth date but is a specific elemental analysis that shows the current elements based on your current preferences and the life experiences that have shaped you. People will change elementally over time depending on what they are experiencing or going through in their life’s. Your UNIQUE detailed report will share with you the essential components you should introduce into your home or work environment to promote your maximum well-being according to your CURRENT elemental nature. Once you fill out our brief online questionnaire you will receive a 8 to 13 page detailed report from a Certified Feng Shui Consultant on your specific elemental nature and needs within your space. It is easy to get your report. Just purchase your low cost elemental analysis for $29 through the purchase button provided. You will then be sent a brief questionnaire. Shortly after you finish your questionnaire your report will be emailed to you. Just Click on the Buy Now Button to Get Started! You can receive your online Holistic Elemental Analysis anywhere in the world. You just need to have access to the internet and have an email address for your report to be emailed to you. Payments are accepted via Paypal worldwide for this service.